Apprenticeship matching is a chance for you to meet with employers and training providers offering Apprenticeship vacancies in Brighton & Hove. These matching events are held at town centre venues on a regular basis. Each event can host up to 100 people looking for an Apprenticeship and you will be invited to attend at an allocated time. may not be able to find what you are looking for at that event. However, you will be able to register with the different training providers to be notified when new vacancies come up and you may find what you’re looking for at the following event. An important part of these events is information, advice and guidance. There will be advisors on hand to meet you and find out about your current situation and what you are looking for. They will let you know what kinds of vacancies are available so that you can speak to the right training providers and employers. 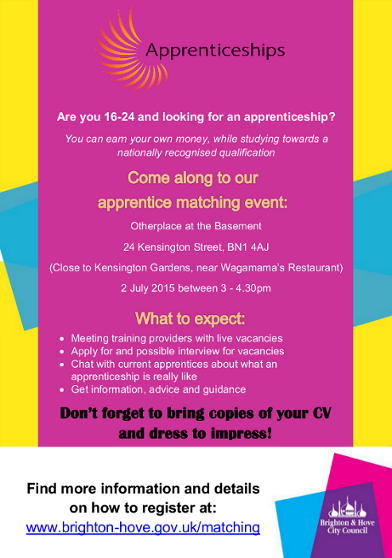 For further information please see Apprenticeship Matching.